I've kitted myself out in a couple of t-shirts from online shops including Napoleon at Wagram, the King's and Regimental colours of the 92nd Gordon Highlanders and one with the coat of arms of the Hapsburgs. 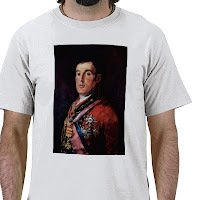 With my recent birthday loot I am outfitting myself with the above designs from Zazzle.com; The Duke of Wellington by Goya and Marshal Soult, the Duke of Dalmatia (or the Duke of Damnation as the British rankers affectionately called him). I'm hoping for an extra psychological advantage over my opponents, but my other t-shirts haven't imparted any advantage yet. Still, I live in hope! Very stylish. I recommend a house rule that provides a free reroll to anyone in the game wearing one of these shirts. What every self respecting wargammer will be seen in this season; very stylish my good man. Could I interest Sir in a new pelisse? Very nice - in fact I'm going to check out their stocks now. 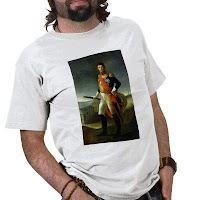 Thought: how scary will it be when you find a painting of Soult wearing a T-shirt with a picture of you on it?